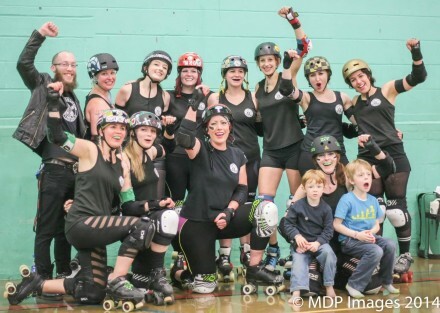 We at NRD appreciate how difficult it can be juggling Mummy duties, and trying to commit to your roller derby community. So we hope you can relax and enjoy your Mother’s Day – you certainly deserve it! Training and competing give me the best possible escape from being a full time mum. I love being able to leave everything at the door and focus on something completely without interruptions, it’s very empowering in an otherwise chaotic week. The kids are still very young and have grown up with the team; as they get older I know that their own interests will start to be a priority but for the moment they love hanging out with their many aunties and uncles and they’re great roles models – even if Ava does keeps bugging us to let her have a princess tattoo! 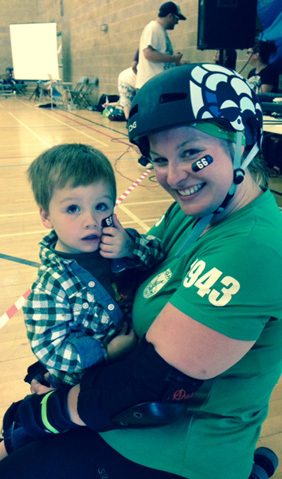 “I’m pretty new to this a roller derby lark having started with the beginners intake at the end of September 2014. There has been the odd difficulty juggling child care and practice, but I was able to bring her along to watch on the side-lines on the odd occasion which was nice and supportive of the league coaches and made her feel included and part of the team. As a parent, and a parent of a girl for that matter, I think it’s been beneficial for my daughter to see me go out to games and attend practice. 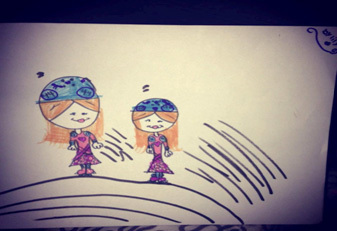 To get into something that is both fun and healthy – and I say this because even in the 21st century it appears girls are not hugely encouraged to develop an interest in contact sports. Previously, I had a massive two year obsession with the gym and even my daughter knew that the gym was a means to an end – it became like brushing my teeth. Routine: “Yawn”. Whereas derby is an emotional roller coaster of fun, frolics and a few “oh my f@@ks!” that combines exercise with fun. The pitfall of missing ( what can be precious time as a family at the weekend) can sometimes be difficult, but seeing some of the little children’s faces when their mums and dads (their freakin’ roller derby heroes) were playing at the NRD and SSB game in February – made it obvious in that one moment which makes up for missing them for a few hours during Sunday practice. A budding NRG player in the making, I hope! 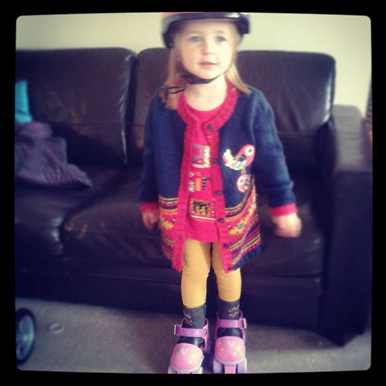 “When a friend (Damndrea) suggested I tried roller derby I didn’t think I would be able to do it as I was a mum, it wasn’t for me and some reason I thought I was passed it! Stupid I know. My confidence was totally knocked after having my son and still isn’t completely back to how it was but roller derby has most definitely helped! It has helped me be me again, given me something else to focus on (apart from nappies, work and studying!) 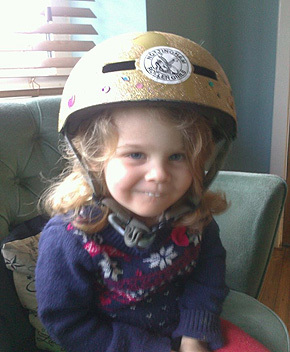 I do find it a struggle committing to events due to limited childcare, especially as my partner plays for SSB. I also struggle with getting to after parties and social events as they often clash with family outings”. I’m always rushing to get to practice on time after acting as Mum’s taxi. 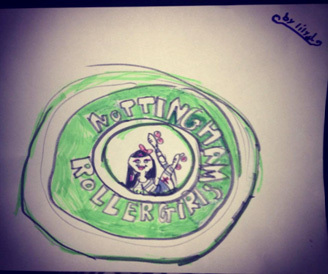 Being a roller derby Mum is an ongoing battle of arranging babysitters to attend a night out, scrimmages and sometimes even practices. RD is much more expensive for me in this way, every time I want to attend something beyond standard practice sessions, it costs me at least 15 quid in babysitting. Leigh never gets to watch the games properly as he is looking after toddlers. BUT we love having them, and they seem to enjoy coming to games. Can’t wait until they start playing! I feel sorry I am not more involved in the running of the club, but I can’t justify more time with RD and seeing kids as much as I’d like to. Even finding time to write this is aaarggh! BUT don’t get me wrong, being a RD Mummy is ace and they are both massive supporters of NRG!